Jingle Bells is a fun holiday party theme for kids, tweens and teens! 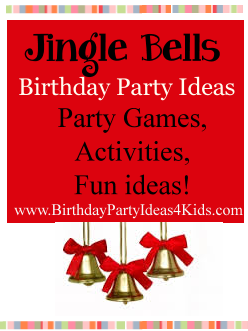 Jingle Bell themed party games, activities and fun ideas for ages 1, 2, 3,4 ,5 ,6 ,7 8, 9, 10, 11, 12, 13, 14, 15, 16 and 17 year olds! Before the party, take four empty liter soda bottles and rinse them out. Put a large amount of jingle bells into two of the liter bottles (fill each bottle about 1/3 of the way full), then tape the empty bottles on top so that it looks like a giant rattle. You want the openings of the bottles touching so that the bells can pass from one bottle to the other. The players try to shake the bells from one bottle to the other bottle in the fastest time. Play with teams by handing off the bottle once a player has transferred all the bells to the other bottle. Attach an empty tissue box to the player’s waist using a rope or a belt. The opening should be facing out. Fill the tissue boxes with ten jingle bells. The players then must jump, dance, and wiggle around to get all of the bells out of the box the quickest wins! Play holiday music while the guests are playing. Fun to play and to watch! Split players into teams of two. Make the players in the teams stand ten feet apart and give one player from each team a small bowl of wrapped holiday chocolate kisses. The player with the kisses must unwrap a kiss and throw it so that his/her partner can catch it in his/her mouth. The team that catches the most kisses after one minute wins! Give each player a set of chopsticks and a bowl. Spread jingle bells on the table in front of the players and have them transfer the jingle bells from the table to their bowl using only the chopsticks. Set a 2 minute time limit and see who can transfer the most bells in that time. Play several rounds. Set up an obstacle course around the party area (or outside if it's warm enough) using chairs, tables, large empty boxes etc. and on all of the obstacles tape or tie jingle bells around the obstacle so that players have to be careful not to touch them. Hang them on string underneath a table or chair, scatter them inside a box that players have to crawl through .... make it hard enough to be a challenge. Have an adult count how many times players make a noise. The player with the fewest jingles wins! Before the party fill the clear plastic container with Hershey's kisses making sure to count how many are in the jar (write the number down and keep in a safe place). Set the jar on a table near the party entrance along with pencils and pieces of paper. When party guests arrive have them guess how many "bells" they think are in the jar and write down their guess along with their name. At the end of the party announce which guest was the closest to the actual number in the jar. That guest gets to take home the jar of kisses as a prize. Send party guests on a Christmas scavenger hunt. Our Christmas scavenger hunt list has lots of fun items to find and is free to print out.